INCREASE YOUR LUCK TODAY WITH THIS FANTASTIC 'LUCKY PANDA' PROMOTION! YOUR POKER MACHINE PLAYERS ARE GOING TO LOVE THIS GAME SHOW PROMOTION! 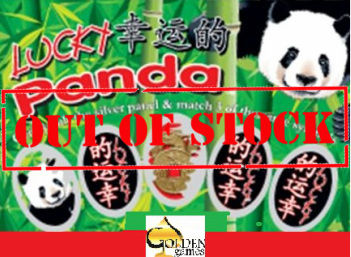 INCREASE THE FUN THROUGHOUT YOUR VENUE & PLAY 'LUCKY PANDA' AS A CASH GAME IN YOUR LOUNGE AREA. KEEP THE LUCKY MEMBERS ENTERTAINED WITH THIS UNIQUELY DESIGNED GAME SHOW PROMOTION FROM GOLDEN GAMES PTY LTD.
INTERACTION BETWEEN YOUR STAFF AND PATRONS IS AN IMPORTANT RELATIONSHIP AND THERE IS NO BETTER WAY TO BUILD ON THIS BY OUR FANTASTIC 'LUCKY PANDA' SCRATCH CARDS.. YOUR MEMBERS CAN WIN INSTANT PRIZES OR THE CHANCE TO ENTER THE GAME SHOW SEGMENT AND WIN THE JACKPOT! BOOST RELATIONSHIPS BOOST YOUR BOTTOM LINE!